Did Donald Trump Jr. Break The Law? Question Hangs Over Washington Trump Jr.'s email exchange concerning a meeting with a Russian attorney last year has raised questions about a federal law that prohibits foreign nationals from aiding U.S. political campaigns. 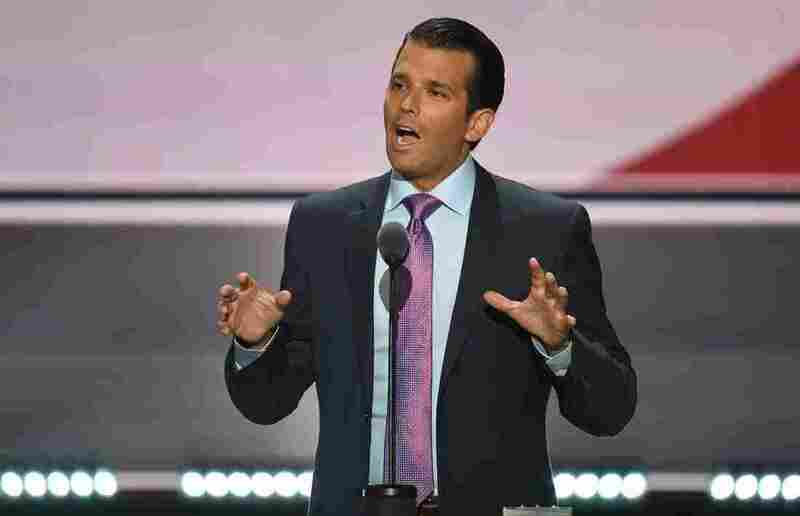 President Trump's son Donald Trump Jr. speaks at the Republican National Convention in Cleveland on July 19. On Tuesday Trump Jr. released an email exchange he had about meeting with a Russian lawyer earlier that summer. That question hung over Washington on Tuesday after President Trump's son released an email exchange about the meeting. The emails appear to confirm he was enthusiastic about an offer of foreign help to attack his father's political opponent, Democrat Hillary Clinton. The problem is that a federal law says foreign nationals cannot "directly or indirectly" give a "thing of value" to American political campaigns. Moreover, the law says no one is allowed to "solicit, accept, or receive" any thing of value from a foreign national to help a candidate. Trump Jr.'s attorney Alan Futerfas says "Don Jr. did nothing wrong," but Robert Bauer, a Democratic campaign finance lawyer, says the law is not on Trump Jr.'s side. "This is a case where a campaign may have been openly courting support from a foreign national in trying win an election. And that is squarely prohibited by the federal campaign finance laws," Bauer said. The emails at issue were exchanged last June between Trump Jr. and Rob Goldstone, a longtime associate. Goldstone offered to serve as an intermediary who could connect Trump Jr. with a Russian official who had information "that would incriminate Hillary [Clinton] ... and would be very useful to your father." Trump Jr. responded by saying, "If it's what you say [then] I love it especially later in the summer." Trump Jr. then not only agreed to the meeting, but also looped in his brother-in-law Jared Kushner and the former campaign chairman, Paul Manafort. The three of them met with Russian attorney Natalia Veselnitskaya on June 9, 2016. Velenitskaya appeared on NBC News on Tuesday morning, saying she actually had wanted to discuss U.S.-Russian adoption policies, and had no political opposition research to offer the three Americans who came to see her. She added: "It's quite possible they were looking for such information. They wanted it so badly." So the meeting happened in early June, and then the following month, hacked documents from the Democratic National Committee appeared online. Democrats accused the Trump campaign of colluding with the Russian hackers to get those records. Trump Jr. went on CNN in late July to dismiss the idea that the Trump campaign would do such a thing. "I mean, I can't think of bigger lies — but that exactly goes to show you what the DNC and what the Clinton camp will do. They will lie and do anything to win," he said. And the candidate himself, Donald Trump, wondered aloud whether Russian hackers could dig up emails from Clinton's server. "Russia, if you are listening: I hope you're able to find the 30,000 emails that are missing," Trump said. Bauer said that Trump Jr.'s email exchange with Goldstone confirms that the Trump campaign was actively trying to get help from Russians. And he notes that foreign nationals don't get First Amendment free-speech rights in U.S. elections, so the law's prohibitions on such help are very strict. After Trump Jr.'s surprising release of his email exchange, White House spokeswoman Sarah Huckabee Sanders read a statement from President Trump: "My son is a high-quality person, and I applaud his transparency."